EXPOs and Graduation parties are held twice per year at Marbella Design Academy; in the middle of June and in the middle of December. Our EXPOs and Graduation parties are always a great success. We guarantee fun evening with excitement, inspiration, a great atmosphere, a fantastic Fashion show of new collections designed by our creative Fashionistas and Design expositions of amazing projects created by our talented Graphic and Interior Architect students. You will be among happy people, enjoy complementary free Cava and great tapas, music with torch lights surrounding our lake full of contented ducks! In all our EXPOs and Graduation parties are totally fantastic events. At our EXPOs and Graduation parties we have around 300 invited guests. Amongst them are several leading companies within the design industry looking to headhunt one of our great newly graduated designers before anyone else. Our EXPOs and Graduation parties are must see events. Everyone has a super lovely evening. Do not miss our EXPOs and Graduation parties! Be the first to know about the next EXPO and register to our mailing list. Email to info@marbella-design-academy.com and you will be notified of our upcoming events. We look forward to welcoming new and old guests at our next EXPO and Graduation party! 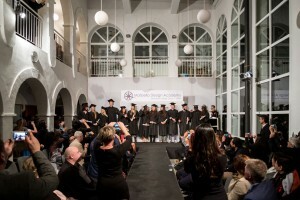 Marbella Design Academy is student focused and we work in a family-like atmosphere. The students are part of a community which is very much orientated to developing co-operations, real life projects with the wider professional industry. Signing up to our exclusive design school ensures you an outstanding quality of student life and a top design education with excellent employment prospects after graduation. Our graduated students have a near 100% employment rate. Our academy differs from many other design schools. We care about each student, nurturing their individuality and creativity and we observe plenty of teacher attention. Our beautiful building has been purposely designed living up to all the demands from the Ministry of Education in Spain for a State Recognised Institution. The Academy is surrounded by lovely recreational areas in one with nature from which both students and staff can be inspired. As a student at Marbella Design Academy in sunny Spain, you will have one of the best times of your life! You get more than the best education in design. Our students also have a great lifestyle!